If you are looking to start regular fitness or training or already training but not getting the results you want we can help you make big improvements to your health and fitness. At Plant Based Life we offer a holistic Personal Training Service that focuses on functional movement and good nutrition. We believe these are the main foundation blocks of improving your overall health. At Plant Based Life we offer properly designed exercise programs and instruction on how to carry out exercises correctly. This is key to attaining the optimum health you deserve. With the correct assessment and advice you do not need to train for hours on end, but it does require commitment. Plant Based Life will provide the motivation you need to reach your goals. What happens when you become a Plant Based Life Client? Your Personal Trainer will carry out a comprehensive fitness assessment and body composition weights and measurements. Based on the detailed assessment & Exercise Pre-Questionnaire your Personal trainer will put together an exercise program to meet your specific requirements. Ongoing Nutritional Advice is provided and we also have an additional service of working with a nutritionist and also a food coach if clients want to take this option. Ongoing weight / measurement and body composition checks done to monitor progress. You will have the option of either 30 minute, 45 minute Training sessions are available in person at selected outdoor locations, we also have a studio in Hurstville and offer an extensive outdoor personal training service in Summer Hill. 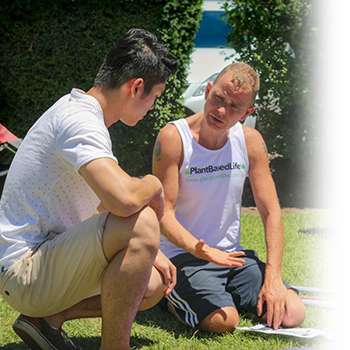 We also have personal trainers available to train people on the North Shore as well Eastern Suburbs, so no matter where you are in Sydney we have options available. No matter where you are with the current level of health and fitness we have solutions for you so contact us to book in a complimentary training session.